The absence of a functional maintenance and repair facility in the country at least in the last 17 years accounts for N22.3 billion local airlines spend yearly repairing their planes overseas. The mandatory maintenance programme, ranging from minor to complex checks per session on an aircraft, could cost over $1 million (N305 million), which is a huge spending by already struggling local airlines with multiple planes in their fleets. And due to the huge financial burden, a total of 73 commercial aircraft operated by eight airlines have lately reduced to 48 serviceable planes. Whereas the financial burden is avoidable by stakeholders’ estimates, overseas repairs continue to drain the lean purse of local operators lowering their capacity, revenue and chances of survival. 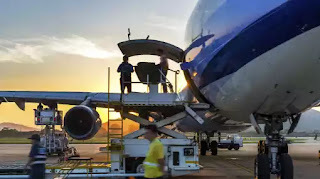 Specifically, a maintenance facility, otherwise known as Maintenance, Repair and Overhaul (MRO) organisation, is an essential requirement in civil aviation to ensure that aircraft are maintained for airworthiness to safely transport passengers and cargoes. Aircraft maintenance checks are periodic inspections that have to be done on all commercial/civil planes after a certain amount of time or usage. Checks range from A to D. A and B checks are minor routine checks that a team of engineers carry out at an airline’s hanger. C and D checks are more complex demanding expertise top-range facility. A C-check is mandatory every 18 months, according to Nigerian civil aviation regulations. It requires the inspection of the majority of an aircraft’s components, some of which may be replaced, during a maintenance programme lasting about two weeks. D-check is the complete overhaul of an aircraft that may be done every six years. Some local airlines currently do A and some part of B checks locally. They all fly the aircraft to Europe or a few African countries for C-check that has been described as the most burdensome on the overhead of airlines. The average cost of a C-check is $1 million (N305 million) or more depending on a number of components that need replacement during the repair. This, therefore, explains why aircraft maintenance alone costs between 15 and 30 per cent of operating cost of most airlines. The Guardian learnt that back in the days of the Nigerian Airways, a national carrier owned and operated by the Federal Government until 2003, all the checks were done locally. Today, all local airlines in commercial operations fly to France, Germany, Lithuania, South Africa, Kenya and Ethiopia, among others, to do C-checks. Arik Air, for instance, currently patronises a MRO facility in Lithuania, a country of 2.8 million population. Currently, eight airlines operate in the local airspace in Nigeria with at least 73 aircraft. Air Peace has 13 aircraft, Arik Air has the largest fleet size of 28 (12 now serviceable), Aero Contractors has 10, with two currently in use, First Nation has two, with one in operation while Azman Air and Med-View have four apiece. Dana Air has five and Overland Airways has seven airplanes. In total, the airlines spend N22.3 billion on C-checks alone in every 18 month. For reasons not unconnected with the huge cost of maintenance, only 48 out of the 73 planes are in operations. The Guardian learnt that the inability of two domestic carriers to pay the bills has left some of their aircraft stranded overseas. Both private and public efforts to revive the essential facility in Nigeria lately have not yielded the desired result. The Akwa Ibom State government, about a year ago, completed its state-of-the-art MRO complex with the hope that both local and foreign investors would be attracted to complement it with more capital-intensive equipment and expertise. None has shown up till date and the hangar lies fallow, The Guardian gathered. Capt. Dung Rwang Pam observed that the then MRO of the Nigerian Airways was a 1977 initiative of the Federal Government to cater for the burgeoning aviation industry. Pam said it was quite unfortunate that 40 years later, despite “bogus contracts in millions of dollars, the facility has not been duplicated; none is on ground today. Spirited efforts by private individuals, corporations and state governments have elicited no support from the Federal Government,” he said. The Managing Director of the Nigerian Airspace Management Agency (NAMA), Capt. Fola Akinkuotu, was recently of the view that MROs are stand-alone businesses and often independent of airlines around the world. Akinkuotu said the onus was therefore on the public and private sectors to invest in the profit-making venture for a win-win regime for the investors, airlines and the economy. To the NAMA boss, who is a former managing director of Aero Contractors, the local MRO is a must for a vibrant, competitive aviation industry, yet not beyond the country. He was of the view that Nigeria could have a functional MRO at the cost of $37 million (N11.3billion), which is less than what all the airlines are spending on C-checks every 18 months. He said given the readily available market in Nigeria and West African region, a loan of $37 at about nine per cent interest rate is payable in less than 10 years. Should the facility make $6.7milion (N2billion) a year, it would have $60.3million (N18.4billion) in just nine years of operations. Nigeria is indeed not alone in the critical infrastructure deficit. None of the West African countries has a MRO, conceding the MRO hubs to Johannesburg, Nairobi and Addis Ababa, Ethiopia – all of which have national carriers that are dependent on Nigerian market for traffic. The dominant MRO players on the continent can be divided into African and non-African. Local MRO providers include South African Airways Technical (SAAT), Ethiopian Airlines Maintenance and Engineering, Kenya Airways Technical and the Air Algerie Technics and Tunisair Technics. Non-African operators include Air France Industries KLM Engineering & Maintenance (AFI KLM E&M), Direct Maintenance and Sabena Technics. There are also joint ventures such as Air France Industries and Royal Air Maroc’s Aerotechnic Industries. Acting CEO of South African Airways and CEO of SAA Technical, Musa Zwane, put the current number of airliners in Africa at roughly 1,300, with approximately 1,000 new aircraft deliveries due over the next 20 years. The politics is that engine and component services are still dominated by the original equipment manufacturers (OEM), which are fast becoming bigger threat to MROs as they enter the aftermarket with total care and support packages. Zwane, however, believes partnerships would solve many of Africa’s MRO problems. “Joint ventures and collaborations would certainly provide this continent with the much-needed economies of scale. Partnering through aviation can lead to economic growth for this entire continent. Now is the time for African aviation to take the lead in propelling this region as an emerging economy,” he said.